Too many B2B enterprise marketers are focusing on their brand rather than their audience while creating content. 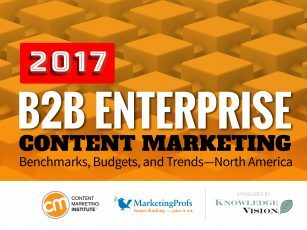 That’s one of the key findings in our new research report, B2B Enterprise Content Marketing 2017: Benchmarks, Budgets, and Trends—North America sponsored by KnowledgeVision. Let’s take a look at the actual stat: 53% of B2B enterprise marketers who responded to our annual content marketing survey say they agree that their organization is focused on creating content for their audience versus their brand. That’s a lot lower than the 69% of all B2B North American marketers we surveyed (across all industry types and company sizes) who focus on audience versus brand. 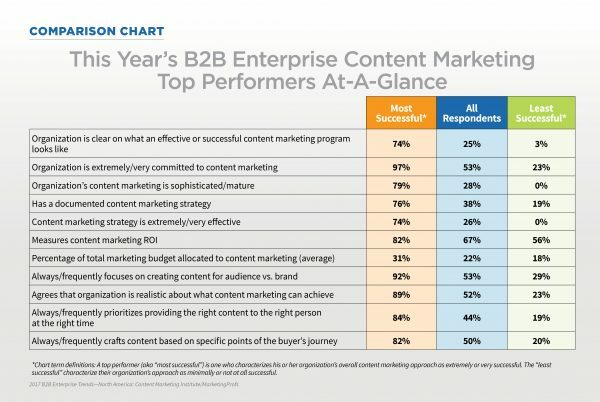 In other words, B2B enterprise marketers are among the worst offenders here. And it’s a turnoff. In fact, in his recent CMI blog post, 4 Content Marketing Things That Turn Off Your Audience, Neil Patel declares that making it about you, not your audience is the No. 1 turnoff. As a brand, it can be tempting to focus on topics that you’re interested in but which aren’t necessarily of interest to your audience. For example, you may be intrigued with industry trends and decide to create blog posts, white papers, infographics, etc., about them. But if they don’t resonate with your audience, you’re going to see little to no effectiveness. In some cases, it can even drive a wedge between you and your audience. I have to admit I’m a bit disheartened by our research finding that only half of enterprise marketers get this. I remember crafting a subhead titled, It’s Not About You, while editing Joe Pulizzi and Newt Barrett’s breakthrough book on content marketing, Get Content Get Customers. That was nearly a decade ago! In all fairness, maybe more enterprise marketers do get this, but are facing internal pressures that prevent them from doing this. The sheer size of large organizations makes content marketing particularly challenging. In any case, it’s an important shift in mindset that has to happen within your enterprise, as a focus on audience is a basic tenet of content marketing. Put simply, you won’t be able to sustain long-term content marketing success if you don’t put your audience first. Now, let’s look only at the top performers in the sample: 92% say they are more focused on their audience than their brand – it’s one of the things that differentiates them from their less successful peers. See the chart below for other ways in which these top performers stand out from their peers. Finding examples of B2B enterprise content marketers highly focused on their audiences is not as easy as you might think. Sure, there are those that have been doing this – and doing it well – for some time (e.g., IBM, Cisco, Intel), but I wanted some lesser-known examples, so I did a basic web search. Unfortunately, too many of the sites were focused on the About Us versus ME – and why I might be there. Atlassian and Deloitte were two exceptions. At the bottom of the home page, I can easily find “Amazing Content” and “Popular Blogs,” with titles like 15 Books That Help Grow Your Careers and Can Humans Thrive in the Bot Economy? This content is created for the AUDIENCE, not the brand. In my case, the content pulled me in so quickly and effectively that it wasn’t until I was about to leave the site that I looked for the actual products that Atlassian develops (Trello, a tool I use, is among them – I had no idea!). I love this copy I found on the Deloitte website while I was searching for the About Us section. “All the facts and figures that talk to our size and diversity and years of history, as notable and important as they may be, are secondary to the truest measure of Deloitte: The impact we make in the world. Deloitte is focused on its audience’s informational needs. 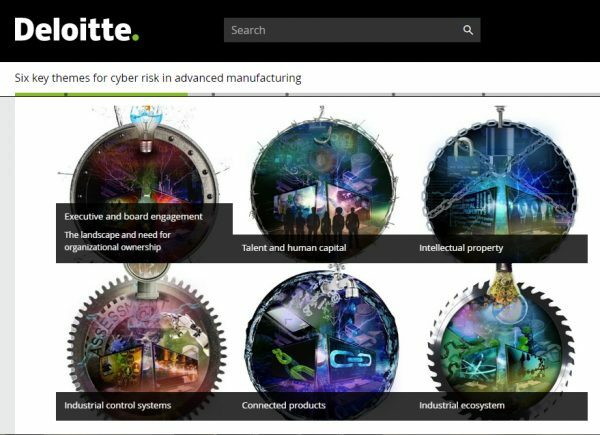 Look at the various forms of educational content it offers on just one subject of interest (cyber risk) to executives working in manufacturing. While enterprise marketers are doing some things right, there is a lot of room for improvement. For example, too few are fully committed to content marketing, too many are lacking clarity about what content marketing success means to their organization, and too few have a documented content marketing strategy to guide their efforts. I encourage you to download the report today to compare how you benchmark against your peers. If you’re doing a stellar job or know of a company that is, please let us know. We’re always looking for great examples to share! We are so excited about all of the data coming out of this research as well as our upcoming reports. If you are as well, please sign up for our newsletter so you don’t miss a thing.